Vallon Cottage is a large, beautiful two-bedroomed cottage built on the side of a steep valley in the pretty village of Youlgrave in north Derbyshire. It has sweeping views of hills, fields and forests that are typical of the Peak District, one of the most visited national parks in the world. The stone cottage dates back to the mid 19th century and has two double bedrooms with their own bathrooms, you will wake up to bird song and beautiful views from the bedroom windows. 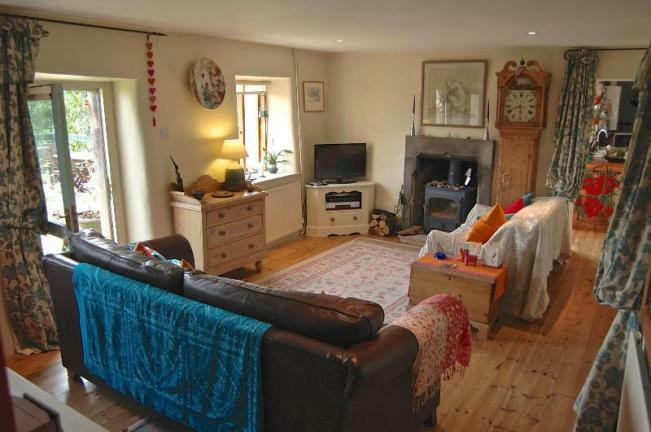 There are two sitting rooms, one with a log burner and one that's light and airy with a high pitched ceiling. A well equipped kitchen with a Smeg oven and Bosch dishwasher. Dining is either in the conservatory or outside on the terrace, where the river Bradford can be heard flowing below in the valley bottom. The garden is full of flowers in the summer and has stunning views all year round. A utility room comes with a washing machine and airer. Vallon is full of character with its thick walls and interesting shapes, it's decorated to make you feel at home, with linens and rugs from India and original artwork. There are many wonderful walks straight from the door and mountain biking and climbing close by. In Youlgrave there are three traditional Derbyshire pubs along with two shops and a post office. Vallon Cottage has a calming effect on all who know it. In sunshine or snow, its charm and uniqueness are sure to make your stay in the Peak District memorable.